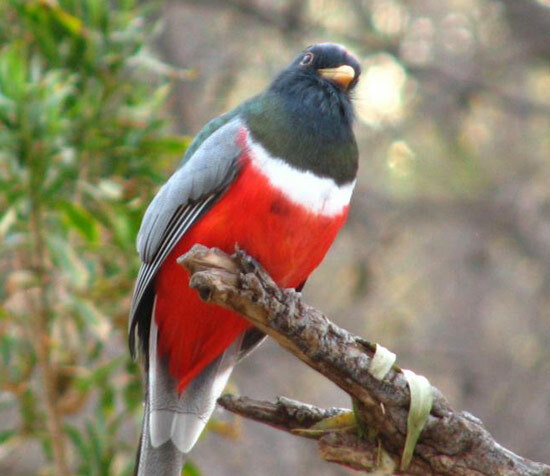 Elegant Trogon: Most adaptable, living in a wide variety of habitats ranging from tropical lowland forested floodplains, high elevation riparian woodlands, aird scrublands, woodlands, and temperate upland coniferous forests. 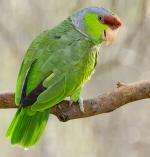 Permanent resident in Mexico, also found in Arizona, southwestern New Mexico and the lower Rio Grande of south Texas. The Greek "trogon" means gnawer and describes the Elegant Trongon’s hefty, serrated bill. A nesting pair cannot excavate their own nest hole and often re-use nests from previous years, most of which were initially made by woodpeckers. The male initially chooses a hole about 25 feet above the ground, but the female appears to make the final nest site decision. Like owls, they can see in low light and turn their heads through nearly 360 degrees. The Elegant Trogon has a current classification of Least Concern. 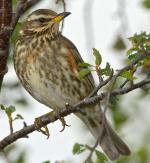 This bird species is a terrestrial bird. 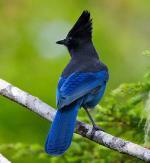 It is native to Guatemala, El Salvador, Costa Rica, Mexico, Honduras, the United States and Nicaragua. The range of the Elegant Trogon is large, estimated to be about 700,000 square kilometers. The population of the Elegant Trogon is believed to be as much as half a million individual birds. The thresholds for population decline have not been met by this species. The previous rating for the Elegant Trogon was Lower Risk, which was downgraded to Least Concern in 2000.